All seem not to be well for the Togolese superlative striker, Emmanuel Adebayor just as FA confirmed recently that Manchester City striker is facing two charges after his controversial behavior during the Citizens' 4-2 victory over Arsenal (Adebayor's former club) at the weekend. Adebayor faces a charge of violent conduct for his alleged kick to the face of Gunners forward Robin van Persie. A statement on the FA's official website explains: "The Football Association today issued two charges against Manchester City's Emmanuel Adebayor following Saturday's Premier League fixture between Manchester City and Arsenal." "Under the fast-track disciplinary process, Adebayor has been charged with violent conduct following an incident with Robin van Persie, which resulted in the Arsenal player receiving facial injuries. "Referee Mark Clattenburg has advised The FA that he did not see this incident, but has confirmed that had he done so, he would have sent Adebayor off for violent conduct. The player has until 6pm on Wednesday evening to respond to the charge." The Togolese striker is also facing a charge of improper conduct, for sprinting 90 metres to taunt Arsenal's fans after scoring City's third goal in the Eastlands win. This caused outrage in the away section, with a steward being knocked unconscious in the ensuing melee in the stand. "Adebayor has also been charged with improper conduct following his actions when turning and running the full length of the pitch to celebrate in front of the Arsenal supporters after scoring," the FA statement continues. "The Greater Manchester Police (GMP) have written to The FA with their views on this incident. 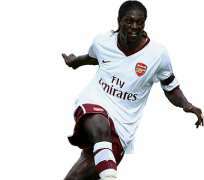 A separate date will now be arranged for a commission to consider Adebayor's goal celebration. "We have also asked the GMP and the clubs to identify those supporters involved in any violent and aggravating behaviour. The FA would like to see anyone found guilty of such behaviour face action through the legal system and banning orders from football. "The FA would like to thank the Manchester City FC stewards for the way they managed a very difficult situation and to pass on sincere best wishes to the steward who was injured during the game. "We will continue to work with the LMA and PFA in particular to help remind players of their responsibilities, especially in highly charged situations." However, the teeming fans of the Togolese striker especially those in United Kingdom have been crying foul over what they called ''cruel decision'' made by the FA officials, saying they over publicized and over blown the little error committed by their man owing to the fact that he left Arsenal for Manchester City and because of racial background. But they consoled themselves with the hope that no matter what the seeming travails could be presently will soon come to an end.